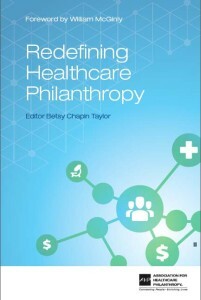 Redefining Healthcare Philanthropy is now available from the Association for Healthcare Philanthropy. The book includes top-shelf thinkers in the development profession in an exploration of important topics to include investment in the funding the development function, achieving strategic alignment, facilitating physician engagement, powering a stronger major gifts program, building a resonant case and driving board engagement. This 250-page, softcover book sells for $24.95. You may purchase copies through the Association for Healthcare Philanthropy or through Amazon.com. The book is available in print and e-book editions. Accordant Philanthropy principal Betsy Chapin Taylor, FAHP, served as the book’s editor and co-author.